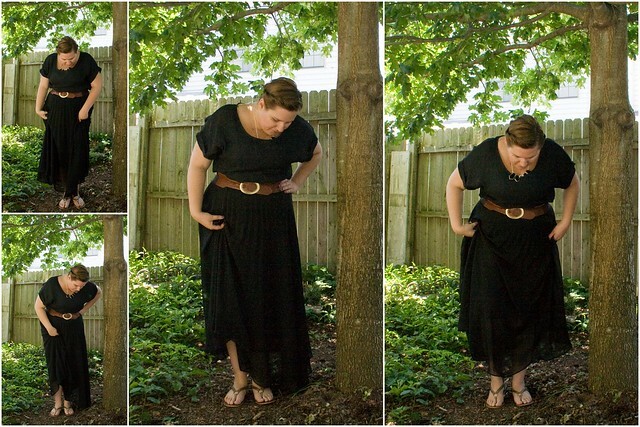 I wore this black Maxi a while ago & just love it. It is the perfect thing to put on if your in a rush, want to look cute but feel comfy, or don't have anything else to wear. It has become a really great part of my wardrobe & I love how versatile it is. I also did a fashion no-no by mixing brown & black but I feel like I love that combo. I guess I love how they go together without actually going together. Having this brown belt breaks up the all black ensemble that I've got going on. Saturday's outfit post featured black too. I hope I am not in some sort of dark mood & it' reflecting in my wardrobe choices. I've been a bit down because Zach is gone (can you believe it's been a month? It feels longer!) but I don't think I've been down enough to resort to wearing only black! This photo collage is completely unnecessary. It looks like I have dropped something! I thought they were all cool, but then I realized I just look kinda weird! But you do get to see the shoes better & you get to see the little rolls I did in my hair. This is one of my go to hair-styles when I have can't do anything with my hair. I've been sleeping in late so I haven't curled my hair at all! Coupled with the fact that I don't have any more hair spray, my hair has been lacking any oomph. I wish I had this outfit in white, I'd feel like a Grecian Goddess & it would be better for summer! This outfit was so comfy to wear on a cooler day but imagine if it was full blown summer heat! Yowza! Earlier, last week actually, I asked a question on Twitter about whether you are a blog looker or a blog reader. I've considered myself a blog reader: one who is interested in content & not just pretty pictures. But lately I've been finding myself just looking at blogs & quickly leaving. I don't know if I'm just not finding blogs I like or what..but it's made me worried that I'm not looking for content any more. This also let me to wonder about scheduling posts. I plan a lot of my blog posts a week in advance because, well, I have a life! For example this post is a scheduled post. Do you skip over posts that seem to be a weekly feature because you often find there's no quality content? I really admire bloggers that throw in awesome content to their outfit posts or even just random posts. I love learning about what people have been doing no matter what kind of post it is. I even love the unsolicited advice I didn't think I needed. But how about you? Do you return to a blog because you know what's coming (like weekly features) or are you always looking for something new on a blog? I've found that keep a schedule of meaningful posts builds readership because people are looking for more! Long gone are the days when I just posted mess from around the internet but I still want Five Sixteenths to be relevant & not just filled with scheduled things. Let me know what you think: Are you a blog reader or a blog looker? How do you feel about scheduled content? Just a quick hello (love the dress btw)! 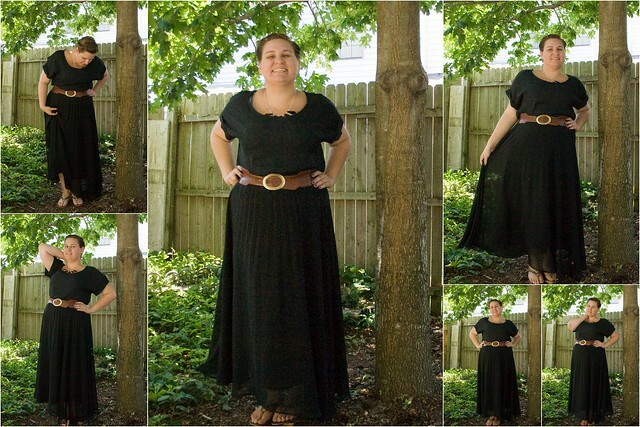 Love this dress...maxis I cannot do because I am a shorty and they are always more than a few inches too long! These bloggy questions in this post really got me thinking. I would consider myself both a reader and looker of blogs - there are some blogs I love because I know the pictures and visual aspects are always wonderful and then there are some that I love to read because I know to expect well-written, engaging posts. And considering scheduled content, I really enjoy seeing the different ways someone can post on the same idea/topic differently week after week. I do like, though, to be surprised by content, too. I guess I am a fence-straddler on all your questions, but I guess I love blogs because they can take on infinite forms and offer such different things. Glad I came across your blog tonight! I love your outfit and your hair looks super cute! I am a reader and looker...depends on the blog and if the post "catches' me or not. But, I guess, that's normal. I'm a blog looker at first. If the pictures and a few lines of text on a post draw me in, I'll read it. I guess it just depends on writing style and content. Even with the blogs I visit daily, I don't always read. Sometimes I love the regular weekly link up posts, sometimes I hate them. So because I know this much about how I read and follow blogs, it kind of makes me think twice about the way I write and post, but then I start driving myself crazy. D'oh! Great outfit! Black and brown work so well together like this.